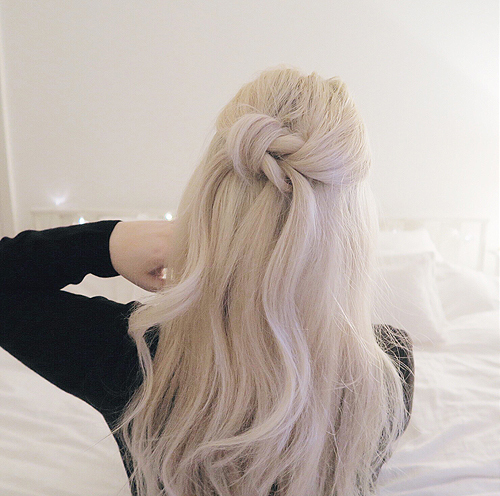 Today's tutorial is a simple one and one that can be done on almost all hair lengths. I've been obsessed by simple looking hair-dos recently and wanted to try out some for myself. These two dos are by far the easiest ones i've done, so i hope you like them as much as me and give them a go. 1. Separate two sections at the front of your head. Think of it as how you begin doing a ponytail. 2. Now tie these two sections of hair together. Exactly how you would when tying a shoe lace. 3. Do the same again, tying the two strands together. Make sure you're feeding it under one section and all the way through. It was hard to show, but rather than crossing them over each other and pulling it through, do it the other way by wrapping it around and under, then pull it through the loop. 4. Now pull the loops together to create your knot. It can be loose or tight, it's up to you. 5. 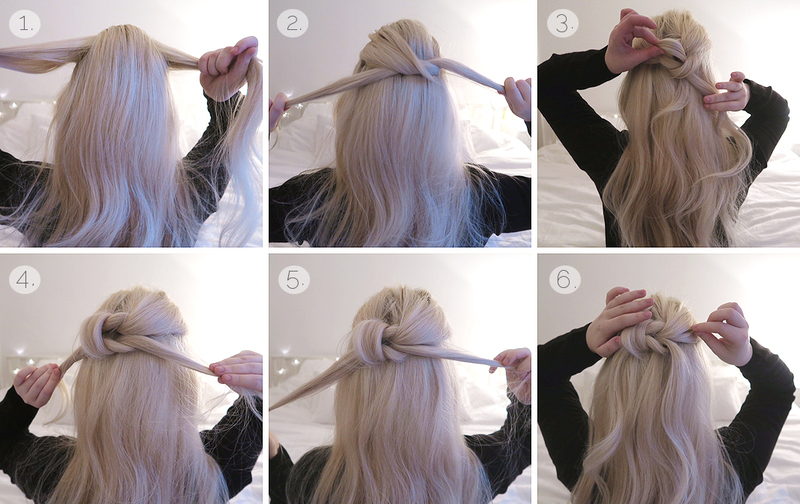 Your knot should now look something like this. You can pull it apart or leave it as it is. 6. Once you've got your desired look, bobby-pin it in place. Facing down on curved side of the clip. 1. Grab a circle section of hair, starting from the front of the head, bringing it around with your thumbs and holding in place. Make sure you have left two large sections of hair out side of it. 2. Now tie this section with a hair band and secure the pony tail. 3. 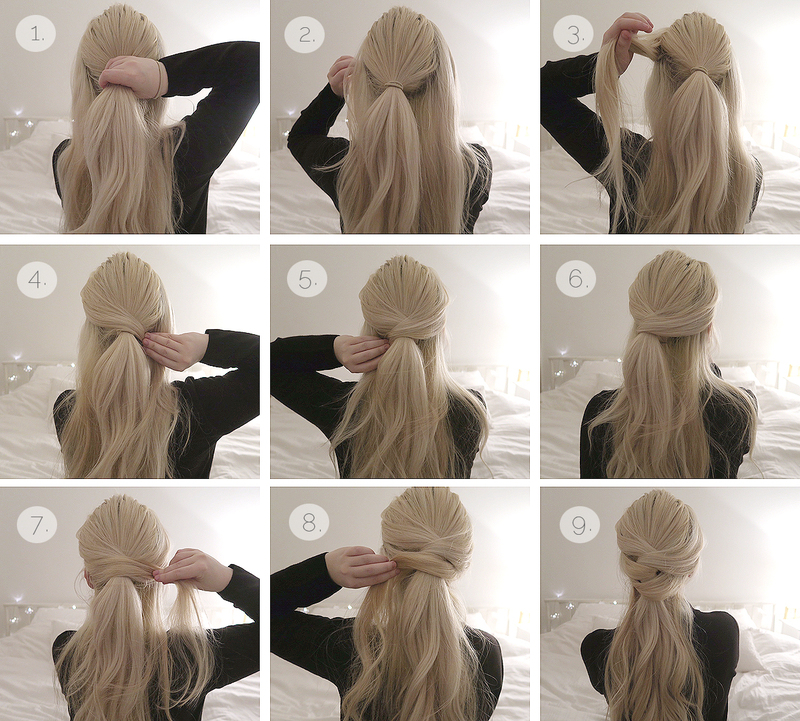 Pull the left section of hair around the pony and pull it around the hair elastic. 4. Follow that by wrapping it over and under the pony tail and securing it with a bobby pin. 5. Do exactly the same with the right side of hair. 6. It should look something like this. You can leave the hair-do like this if you wish. 7. Grab a new section of hair & wrap it around the pony tail and hide it under by securing with a clip. 8. Do the same on the other side, pick a new section of hair on the other side and wrap it over. 9. It should now look something like this. You can wrap around new sections of hair as many times as you like! Yes! This is a deal and i'll make you do my makeup forevs ;) love you!! Nice Hair Style, This blog is very informative i got very informative knowledge from this blog.